I was brought up in New York City by atheist parents who met in the Communist Party, became disaffected, and then became informers for Senator Joseph McCarthy. God was no more real to us than elves might have been to most of you. My first prayer was suggested to me by my godfather-to-be, a professor at Fordham University. I was studying Catholic philosophy in a frantic attempt to find some truth that would keep me from despair. “Why don’t you kneel and say the skeptic’s prayer?” Dr. Balduin Schwarz suggested to me one day. This “skeptic’s prayer” came to me during a tour of Europe. On the stop at Lourdes, France, the first answer to my prayer came without my realizing it. Mary began to intercede for me — first, by showing me the beauty of the candlelight procession of the pilgrims at the miraculous shrine of Lourdes. Shortly afterward, a picture of Jesus came alive with His eyes looking right at me! All the lay Catholics who surrounded me at the time of my conversion in 1959 were Benedictine oblates who went to daily Mass and prayed parts of the Liturgy of the Hours in Latin. I had a book for Holy Mass with the Latin on one side and English on the other and the same for the Liturgy of the Hours. At first I didn’t realize that receiving Jesus in Holy Communion was the highest prayer. This article is from “When Women Pray.” Click image to preview or order. This was a far cry from the meditative Scriptural Rosary, but it was a start, and it wasn’t long before our Mother in heaven gave me feelings of comfort praying those wonderful words on those little beads. Later I would write a book with Sister Mary Neill, O.P., called Bringing the Mother with You: Healing Medita­tions on the Mysteries of the Rosary. I wasn’t consciously trying to form a feminine bond with Mother Mary, but I now see that the consolation of the Rosary was her motherly heart comfort­ing me. Ten years after my conversion, I knew only formal prayer, which I loved for its beauty and truth. But I had never prayed in my own words from my heart. When my godfather suggested that I try to pray from the heart for at least ten minutes a day, I didn’t catch on well. But I muttered a few words while doing spiritual reading. The big change in my prayer life came in 1969, when I was prayed over for the new release of the Holy Spirit (a personal Pentecost) and received charismatic gifts. I could hardly sleep for the joy that was in me. From then on, I wanted to talk all day to Jesus from my heart. My biggest new understanding from the charismatic gifts was that God was not only Truth, but also personal Love. This was just before I started teaching philosophy at Loyola Marymount University, where there was a small charismatic prayer group that grew within a few years from about seven students and a priest to five hundred. Praying to the Holy Spirit before each philosophy class led to a change in the way I taught for the next forty-eight years. I assumed that I would simply use the notes I had from graduate school and my favorite books on each philosophical subject, and possibly write occasional articles in academic journals. Instead, the Holy Spirit led me to infuse prayer into the classroom, not just at the start and the end of each class, but as occasion arose. If a student mentioned being anxious about a sick relative and wondering how a God of love could let people suffer, I would stop the class and have us all pray for that person. Since the students didn’t seem to like the books I assigned, I started writing ones I thought would fit their needs. Sixty books later, I am still at it! The next big change in my prayer came in 1976 in this manner. Some women devoted to Our Lady of Fatima asked me if I wanted to have the pilgrim statue of Mary in my home for a week. “I’m not sure,” I replied. “Most of my family isn’t that devout.” “No one wants her for Christmas,” sighed my friend. It was a busy day when the bell rang and three women came in carrying a small coffin-like box. Opening it and setting the replica of the famous statue of Our Lady of Fatima on a table, they took out booklets with prayers. I groaned. I didn’t really want to say a lot of prayers just then. We got to the sentence: “Mary, take my cold heart and put your Immaculate Heart into me instead.” At that instance, a sudden rush of peace filled my soul. This peace lasted for two whole years! Now, to understand how surprising this is, you have to know that I am a highly nervous, irritable woman who never experi­ences peace at all, much less abiding supernatural peace. Mary is the instrument of peace that I needed desperately. The graces of Mary, the Church’s greatest contemplative saint, flooded my soul, especially during the night. Bursts of love, interior visions, and words in the heart called interior locutions (not audible), became common. Even my prayers in response seemed inspired and came forth in sweet grateful words of love. After that spectacular two-year period, I lost the profound abiding peace but continued to experience beautiful graces in prayer for many years. The death of my young adult son to suicide was the heaviest cross I have ever carried. I immediately identified with Mary’s grief as depicted in Michelangelo’s Pietà. I also identified with the seven swords that pierced Mary’s maternal heart. I prayed and prayed for a sign that my son’s soul was saved. I wrote a long account of his death, and also my husband’s death only two years afterward, in a book titled Weeping with Jesus: From Grief to Hope. At a healing conference, the Lord graciously gave me a sign, an answer to my inquiry about the salvation of my son. In my heart Jesus said, “Your son experienced his foretastes of heaven in his joys. The pain of his interior emotional sufferings was unbearable. . . . You will find him in my Sacred Heart.” Christ comforts the maternal heart. The death of my husband ushered in a period I called “the gray night of the soul.” My experience was nothing as extreme as what St. Teresa of Calcutta went through in her dark night of faith. My prayer in the gray night of the soul was filled with aridity, but I was faithful to prayer without the warmth of consolation. I persevered through the grayness that eventually gave way to the light of a new day. The feminine heart is resilient. I thought I’d try to join a religious community under forma­tion to include widows, but several attempts indicated that this wasn’t God’s plan for me. At that time there was talk of the Church reviving the con­secration of widows as a vocation. If you read the Acts of the Apostles and the letters of St. Paul with this in mind, you will discover that there is mention of the younger “drunken, gossipy widows” contrasted with the ones over the age of sixty who live only for Christ and the Church (see, e.g., 1 Tim. 5:9–13). As I write this chapter, the Vatican is about to issue a ritual and rule for such consecrated widows. Bishops all over the world have been assisting in the formation of widows who want to live a consecrated life, not necessarily in community, but in the way that consecrated virgins live in the world to transform it. In the meantime, a spiritual director suggested that I call myself a “dedicated widow” with a rule similar to those in process for consecrated widows. Here is the rule I have been living for the last eighteen years: I have made and renewed a private promise never to remarry. I try to live simply, and whatever money I have left after the necessities, I give to the poorest of the poor or to pro-life or other worthy apostolates. I dress in simple blue clothing: jumpers or dresses with blue or white sweaters or blouses, in honor of Mary. I attend daily Mass and go frequently to Confession. I pray the Rosary, the Chaplet of Divine Mercy, and the Liturgy of the Hours and meditate on spiritual readings each day. I spend an hour in silent contemplative prayer, either in a church or at home. I devote most of my time to apostolic endeavors such as writ­ing, speaking, and teaching. I am not under strict obedience but I do follow the advice of my spiritual director. Before I made this private promise and started praying in this way, I thought that choosing Jesus as a second Bridegroom would cause me to be a little more faithful and ardent in prayer. Instead, I came to realize that having Jesus as a Bridegroom means living in a different spiritual mansion of the interior castle. How so? In Catholic theology a spiritual consecration is described as loving God with an undivided heart. I was a married woman when I received the grace of a mystical exchange of heart. My life was walking hand in hand with my husband, who, by the way, became a Catholic many years into our marriage. After my promise to God as a dedicated widow I placed both my hands in the hands of Jesus Christ. Through prayer, I surrendered much more to God. I no longer struggled with a codependent style grasping for human love. I abide now in the love of my divine Bridegroom. Let me conclude with some overarching thoughts about feminine prayer. Catholic theologians generally agree that the soul itself is feminine in relationship to God whether the human person is female or male. This is largely because of the feminine capacity for receptivity of the things of God. This feminine dimension facilitates contemplative prayer. That is why, even with our busy lives, we should make time for contemplation, disposing ourselves for the grace that God desires to give. My guess is that some of you women readers are like me — high-energy workaholics who have an unfortunate tendency to squeeze daily prayers into an agenda filled with lots of other items. Even if the prayers I say are beautiful, such as my daily Rosary, if I pray them very quickly to “get them done,” this is not conducive to contemplation. Instead, I should treasure my quiet contemplative prayer time, making it a priority after daily Mass and work obligations. I should relax into deeper prayer. The Rosary, the Divine Mercy Chaplet, and spiritual reading can be part of my quiet prayer time. But I need to enunciate the prayers slowly enough so that their meaning sinks into my frenetic little soul! Otherwise, I adopt the more proverbial masculine, task-oriented way of doing things. I find that, in the image of Mother Mary and the women saints, most of us Catholic women pray in a slightly more heartfelt way than most men of my acquaintance. Those men love very much images of prayer such as spiritual warfare. I like to fight the battle against the wiles of evil spirits every day with the methods of spiritual warfare taught me by mostly male mentors. On the other hand, I never want to be one-dimensional in prayer. I desire to make room in my life for the deep experience of contemplative prayer for which the feminine heart is made. 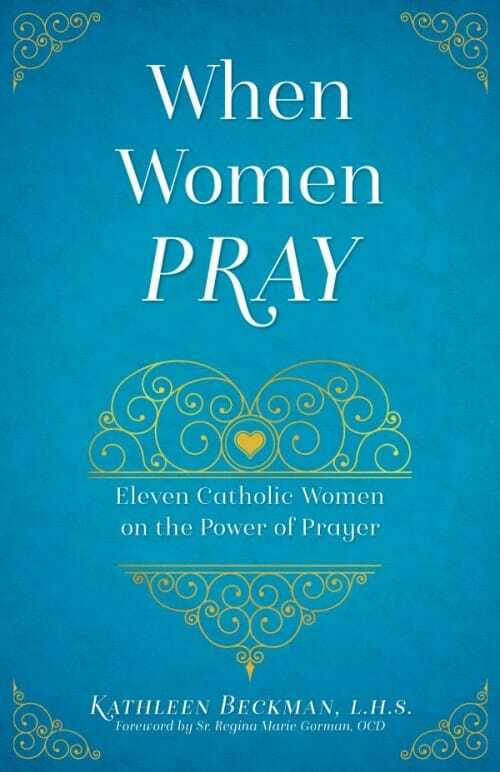 Editor’s note: This article is from a chapter in When Women Pray: Eleven Catholic Women on the Power of Prayer, which is available from Sophia Institute Press. Ronda Chervin received a Ph.D. in philosophy from Fordham University and an M.A. in religious studies from Notre Dame Apostolic Institute. She is a widow, mother, and grandmother. Ronda converted to the Catholic faith and has been a professor of philosophy and theology at Loyola Marymount University, the Seminary of the Archdiocese of Los Angeles, and Franciscan University of Steubenville. She currently teaches philosophy at Holy Apostles College and Seminary in Cromwell, Connecticut.